Here are my slides from the 2012 International Society for the Systems Sciences conference. I organized this talk as a set of 12 propositions. 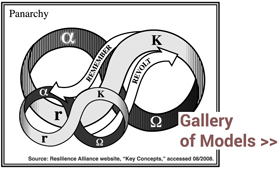 The core idea is that the stability landscape metaphor, as developed by the folks in the Resilience Alliance, can be used as a heuristic for engaging in social change work.